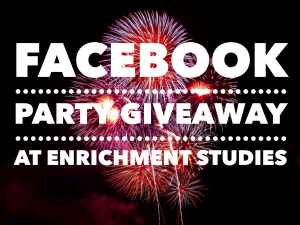 Facebook Party Final Giveaway: The Whole Shebang! I have one more giveaway for you tonite, and this is the Big Kahuna! One lucky winner is going to win THE WHOLE SHEBANG! What is it? Every single collection we offer! All the Fine Art Pages! That’s right! Over $350 value! 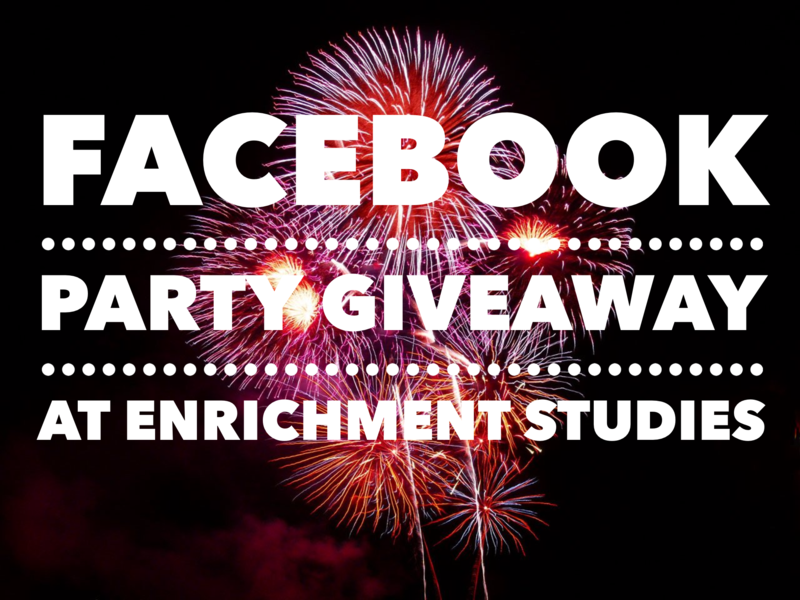 Winner receives access to all of our current collections! To enter, simply leave a comment telling me which collection you will want to use with your kids first. Be sure to enter your email in the comment form so I can contact you if you are a winner. Winner will be chosen tomorrow and will be announced on the blog plus contacted personally by me. **Comments are now closed. The Winner is Sheryl H! I would like to implement your penmanship & copy work immediately. and how to maybe scientist and inventors soon, art! YES, Jazz! YES!!! Oh my goodness! I would absolutely appreciate this. I would like to start with the Artist Study! I would use the art first, because I am not great at art, drawing or teaching) so I think I would use that one first! Female artists from the 19th century. My girls are budding artists and I would love to showcase great women to them. We love music. We will listen and enjoy anything with music, first! I’m anxiously waiting to do Inventors and Scientists!! Thanks for the wonderful party Erica! Wow!!! I’m not sure where we would start. Maybe composers? Nah…maybe Inventors?? LOL. I have no idea!! I’d love to use the Composers Unit first. Wow…hard choice…but probably art…although the kids might vote for the scientists or inventors! I think we’d start with the Jazz Composers! How can you choose!! They are all amazing! I am so fond of the arts, it builds and allows our children to get out of themselves and explore a realm that society tucks away. Thank you for sharing your love of the arts to us all. Blessings to you. I think I would most likely use Art Appreciation first. But, maybe the Composer Study? LOL! How about BOTH! Yeah! We all need a little art and music in our lives! These are awesome! I think I would start with the Artist Study because it is something that I’ve neglected to teach consistently. Our family would probably dig into the scientists & inventors first if we won this because my teens are into that right now. CC Composers, Tin Whistle, & Music Theory for Cycles 1-3 is hwat I would be thrilled to start with. My daughter listens to classical all day if I let her, Id love to have a curriculum to teach her about them from! So many choices….probably we would have to start with the inventors and the copywork!! If we won, we would use the Inventors Studies first. We are so excited to incorporate these into our school next year! I think I would start with the Artist studies. It would be great to do a specific artist each week and have the kids learn about them. Then move on to scientists and inventors! The sciences for sure. My son’s favorite subject so i think this would be the easiest to start with. Thank you so much for the great party and the opportunity for all the giveaways. We would probably start with Scientists and Inventors due to my daughter’s current interests. Oh wow! I’d definitely use the Jazz Composers first. We read a wonderful book called “Acoustic Rooster” today and that sparked a lot of talk about the real-life counterparts to the barnyard characters like “Duck Ellington” and “Bee Holliday” or “Mules Davis.” I’d love to feed that new interest! Thank you. I would probably start with the Composers study. Oh, I know I would jump in Composers first, then Artists! I’d choose one of the musicians first. Need to look which one is being highlighted in my daughter’s Kindermusik class right now. Since my son just studied all about Jazz, I would like to start that one with him to help him learn even more about Jazz composers. It will help this momma too! We love them all! My sone really enjoys art so Artists Study would probably be our first choice but we would study a bit of all of them at a time! WOW! Well, I’d say definitely the Composers collections to start with, as I was planning on doing some more study on a couple of the included Composers with the kids this term already (but not near as enjoyable as your study units). But then again, we’re also going to be zoning in on a couple of Artists this term that are included in a couple of your Artist collections, & same for a couple of Inventors/Scientists …. Soooo, considering how enjoyable your units are, my previous study unit plans for this term, & my sheer delight & excitement in having such resourcers at my fingertips all of a sudden if I were to win; then I’d have to say we’d more than likely be taking a dollop out of a few units all around the same time (straight away, lol) & continuously throughout the rest of the year & coming years. Will cross my fingers & toes, like many others will be too. And thanks so much for all these wonderfully generous giveaways! I think we would start with inventors because my son would LOVE that. Although the Jazz sounds neat and we could add in some of the composer stuff to what we are already doing. Awesome, I would start my children with the Composers as Classical Music has always been my first love and I really want my children to learn about this subject. Great Site and wonderful giveaways thank you for this opportunity! This is awesome! We would definitely start out with the composers first, as we will be heading to the symphony twice in the next two months for both a Mozart and Tchaikovsky performance. We are really looking forward to it and this study would be so wonderful to get us ready to enjoy it even more! I’d love to start teaching my kids about artists first!! I think I’d like to start with an inventor or scientist! I struggle with including science stuff because it isn’t my favorite. We do CC so I would start off with whatever matches our current CC work. I would probably head over to the scientist and inventor collections first if I won the whole shebang! Although the jazz collection would give us a break in our current studies and help us focus on a different type of music. Thank you for hosting such a generous giveaway that will truly bless any homeschool family. Wow, this has been so fun for me, even though like you, I’ve made dinner, led the clean-up brigade, helped with physical science homework, fielded a few phone calls and many other things during the party! All of your studies seem so well done, it would be hard to choose the perfect one, but I love history, so perhaps the presidents, or inventors combined with the copy work. Of course my 14 yr. old son who has a new passion for piano keeps popping his head in to tell me, “COMPOSERS!” Thanks so much for the opportunity to try your things. Many blessings to you! I kind of want to do the penmanship one myself! we would probably start with the copy work and presidents. But composers would be a close second, or first! We’d start with the composers. The Fine Arts pages for my picture-loving younger kids. This is a wonderful contest! We would love to study, and start with, the Composers. This very exciting! Wow! I would love to win, I think I would start with artists because my daughter LOVES art. I would do scientists next because I love science :). Thank you for all the wonderful giveaways. My friend invited me, I hadn’t heard of you before. I am very impressed with everything, great job! Can’t wait to purchase my first set! I would love to win. I would start with the art appreciation first. Thank you for the wonderful giveaways!! Oh, where to begin?? My initial thought would be composers, but quite honestly I think we’d be in more than one area at a time! Too much great stuff here! We would DEFINITLY be opening the Artists series first;). This is so exciting!!! Hmm…couldn’t we just have enrichment month? Lol! I think we would start with the artist studies. I am looking forward to your upcoming poetry studies. Thank you! I would love to win! You have some great resources. I would use the artist studies first as I have just started adding that to our curriculum. It takes a lot of time to research for fun things to do for each artist. The science, copywork and musicians are also things that I would add too! The artist study would be a great starting point for my littles. Really enjoyed all of this this evening and loved all the information!! Thanks, it was a great party! Scientists and inventors for sure! My daughter is really in to science. Hopefully there are some women in there! If its not too late yet -I’d like to start my kids with the Composers Study. Thank you! We’d start w Presidents! It’s always so intriguing to learn about the men who have held the position of most power & influence as our great country has grown. Wow! I would start on the Famous Inventors Collection first, since we’re doing a unit study on electricity right now and have been fascinated by the various inventors! We need the presidents right now! I would start with the composer study. Honestly? Knowing myself? We would dip into ALL of them right away!!! How exciting!! We’re smack-dab in the middle of World History this year so I’d jump right in with a mixture of Artists for art studies, Composers for music appreciation and Inventors/Scientists for science biographies.Thank you for all the hard work you have put into making teaching these subjects for the non-inclined (that’s me) much easier. We would love the fine Artist study. Art isn’t my strong point and when I start researching it for the kids its so fascinating I don’t want to stop. Then there’s the presidents and I have a major science lover here…So, really EVERYTHING! I would use the Presidents copywork first for my 10 year old son. We’d probably start with Composer Studies first but that is a very hard decision. We’ll use the composers first. That was what brought me to your website to begin with. Thanks for all of your hard work.